A work-related injury or illness can ultimately interfere with workers’ ability to earn a living. Falling ill or becoming injured creates unexpected expenses, such as medical bills, rehabilitation expenses, and lost wages. For this reason, workers’ compensation in Ohio provides workers with wage replacement. The type of wage replacement that workers are eligible for depends on their situation and the severity of their condition. If you need wage replacement in Cincinnati, the best way to ensure that you receive the resources that you need is to seek the help of an experienced wage replacement attorney. The lawyers at Lawrence & Associates understand the challenges that you are up against when your injury interferes with your ability to work. Workers in the Cincinnati community have trusted us with their cases over the years because they know we can deliver. We aim to alleviate the stress and uncertainty that you may feel by being a reliable, guiding hand as we work to help you obtain the resources that you need. Our experience has given us the opportunity to work with many families in the midst of difficult times, and we want to help you too. We’ll lead with compassion and understanding and put our legal knowledge to work for you. If you are ready to reach out for legal help, we’re ready to speak with you. Call us at (513) 351-5997 to schedule a free consultation. Do I Need a Wage Replacement Lawyer? If you’ve become sick or have been injured at work, hiring a competent lawyer to assist with your case is the best way to ensure an optimal outcome. Many people are concerned that hiring a lawyer will only complicate their situation. In reality, a lawyer’s assistance will ensure that you are organized, prepared, and informed throughout the process of collecting workers’ compensation benefits. In addition to making sure that the wage replacement that you receive is fair and corresponds with your physical condition, a workers’ compensation lawyer will help with the administrative tasks of your case, making sure that everything is above board and that you don’t miss any crucial requirements or deadlines. Depending on your injury or illness, you will be eligible for different types of wage replacement: temporary total disability, permanent partial disability, or permanent total disability. A lawyer can help give you a better idea of which benefits you will likely be granted. If you suffer from an occupational illness or injury, you shouldn’t then be expected to become an expert in workers’ compensation law. Hiring a lawyer ensures that you can get the best possible information and outcome while being able to focus on your physical recovery. 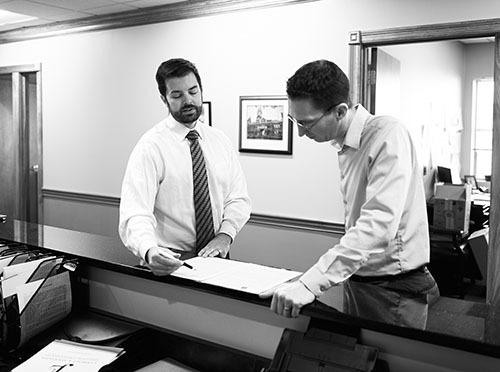 The skilled workers’ compensation team at Lawrence & Associates has been working in the Cincinnati community for years, providing high-quality information and service to clients who need help the most. In the midst of a serious illness or injury, financial uncertainty is an extreme stressor for many families. This stress is often well-founded, because medical treatment, hospital stays, and rehabilitation efforts are expensive. Coupled with being unable to report to work, the financial strain of injury-related bills makes it a trying time for many Cincinnati families. Over the years, our team has helped ease the situation of many Cincinnati workers, and we want to help you. We value candor and communication and want to keep you as informed as you would like to be throughout the process of seeking wage replacement benefits. The benefits’ process can go smoothly for some people yet can be complicated for others. In either case, the help of a lawyer will ensure that you aren’t tasked with disputing or appealing claims if things don’t go in your favor. If you are looking for solutions after an occupational illness or injury has left you unable to make a living, reach out to a member of our team today. There are three main classifications of wage replacement available to injured or ill workers in Ohio. Your physical condition and expected recovery will help determine your eligibility for temporary total disability, permanent partial disability, or permanent total disability. Each form of wage replacement has a unique set of provisions and requirements. An experienced workers’ compensation lawyer will help you further understand each of them. An employer’s state-fund or self-insured workers’ compensation plan will cover an injured worker’s medical expenses if an employee’s work-related illness or injury has kept them from working for seven or fewer calendar work days. Ohio workers’ may be able to begin collecting wage replacement if their condition has prevented them from working for eight or more calendar work days. After an occupational illness or injury has left you in a compromised physical condition, temporary total disability benefits may be your best option. A lawyer can help you find out for sure. Permanent partial disability benefits may be granted to workers if they can work but are unable to perform at the same physical capacity. Ohio workers who are pursuing benefits must undergo a medical examination in order to calculate permanent partial disability. The purpose of this examination is to assign them a number which will indicate the impact that the injury will have on their ability to work. This number is known as a whole person impairment, and it determines how severely the work-related illness or injury has altered the worker’s ability to do their job. In determining the amount of permanent partial disability payments, the workers average weekly wage and whole person impairment number will be taken into consideration. Employees who sustain injuries so severe that they are unable to work may be eligible for permanent total disability. The injury must be proven to have occurred because of a work-related injury. Permanent total disability is meant to offset the wages that seriously injured workers no longer have the potential to earn. Those who are eligible for PTD can collect it for the rest of their lives. To determine eligibility for PTD, injured workers must undergo an examination conducted by the Industrial Commission of Ohio in addition to a hearing. The process for applying and being approved to receive permanent total disability tends to be more rigorous than other disability benefits because workers stand to receive these benefits for the rest of their lives. A claims service specialist will help determine the amount that the permanent total disability checks will be. In calculating the payments, two factors are taken into consideration: the worker’s average weekly wage at the time of the injury and the average statewide wage. If a worker is approved to receive permanent total disability benefits, they will typically also be evaluated for benefits from the Disabled Worker Relief Fund. This DWRF adjusts disability payments according to the current cost of living. These adjustments are made using the consumer price index. If an occupational illness or injury has seriously impaired your ability to perform your work duties, you may be eligible to collect permanent total disability. Contact a lawyer to help guide you while you pursue these benefits. At Lawrence & Associates, we know how difficult it can be to reach out and ask for help, but we are here when you are ready. We work to ensure that workers in our community are empowered, even when they are recovering from or struggling with an injury or illness. Though there are many intricacies when seeking workers’ compensation benefits, our experienced team aims to keep you and your family informed and better positioned to get the benefits that you need. While injuries are often an inconvenience and a financial burden, a lawyer can help you manage the effects that they have on your finances. A wage replacement lawyer from our skilled legal workers’ compensation team will only serve to simplify your situation. To learn more about how a member of our team can help you today, call us at (513) 351-5997 today.